Trips to CVS are such a mine field for me. I go in only needing a tube of toothpaste or a birthday card or a 12-pack of Diet Coke (or 3) and walk out with a bag full of makeup. I just cannot resist the siren call of the cosmetics aisle no matter how hard I try. That's how I wound up with the Revlon Photoready Primer + Shadow Palette in Pop Art. It was purchased on a complete whim when I did a quick browse of the makeup section and saw that Revlon was on BOGO 1/2 off. It wasn't the primer shadow that the palette supposedly has that caught my eye -- it was the sparkle topcoat. Each palette contains a primer shade, three traditional shadows, and the sparkle topcoat. These palettes are available in 8 shades, I believe, and there were several pretty ones with purples and pinks or nice natural shades. But I tried to go outside my comfort zone and went with Pop Art, which is a green-based collection. The primer shadow in Pop Art is sheer white shade with slight green cast and a satin finish. The lid color is a particularly interesting shade -- it's a sort of metallic sage color with some mint and brown in it. The crease shade is a dark khaki with gold glitter. The highlight is a sheer shimmery gold with slight glitter. The sparkle top coat is a sheer army green-ish color with gold, blue and green glitter. After I bought the palette, I read some reviews of this line and they were pretty mixed so my expectations weren't that high when I used the shadows for the first time. But honestly, I was pleasantly surprised. 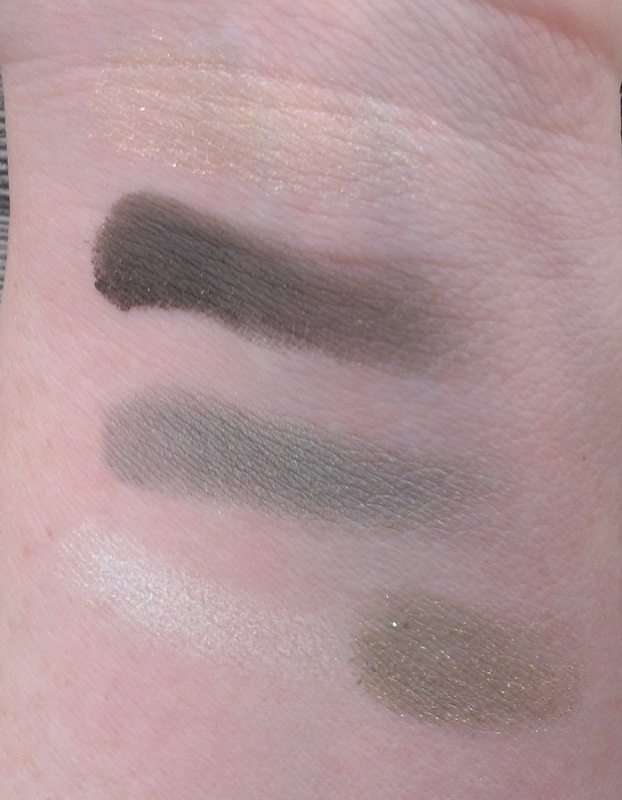 As you can see from the swatches, it's only the primer shadow, highlight shade and glitter topcoat that are sheer -- and that's fine really. You don't need any of those shades to be super pigmented, at least in my opinion. The lid and crease shades are nicely pigmented, though, and are both easy to work -- they apply and blend very easily. I used the palette pretty much as Revlon suggests -- I didn't use the primer shadow on its own because honestly I put on my Too Faced Shadow Insurance without thinking (it's just too much of a habit) but I applied it over the lid and up into the crease as base layer. I put the lid shade over it from lashline to crease and the crease color in... you guessed it! ... the crease. I didn't use the gold highlight shade as a brow highlight, though. With my skin tone, that would look a little odd, I think. And there's plenty of glitter and sparkle in this look so I didn't really need any up there. Instead, I went with a matte skin tone shade (MAC's Blanc Type) on my brow bone and used the gold highlight shade in my inner corner. According to Revlon, this shadows can be used wet and dry, which is always cool, but the only shade that I felt the need to do that with was the glitter topcoat. It has a dry, hard texture and I feel like applying it dry doesn't do all its sparkly goodness justice. If you tap your brush in it and then spritz it with a little water, MAC Fix+ or your setting spray of choice, it really makes the glitter pop when you pat it on the eye. I just put it in the center of my lid to keep from looking too disco ball-y during the day. However, if you're going out at night, I think pressing it all across the lid would be super pretty. When I wear Pop Art like this, the effect is a really pretty, shimmery green smokey eye. In fact, it's the eye look that I wore for St. Patrick's Day (I've got a little Irish in me so I had to represent). I've already worn it a handful of times in the month or so that I've had it, which, if I'm honest, is a lot more than I thought I would. 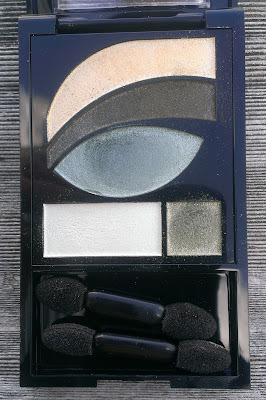 I can't vouch for the other shades in the Photoready shadow palettes, though. Reading other reviews, there seems to be some difference between the quality of shadows in each palette. So while these are nicely pigmented, you might not be so lucky with some of the others. I'd probably do a little research if you're interested in a particular palette before making a purchase. All in all, I'm very happy with Pop Art. 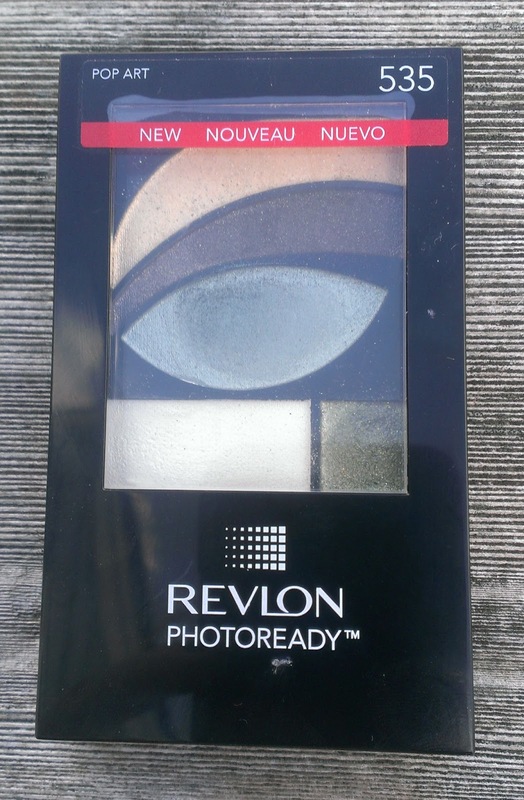 I wouldn't say that everyone needs to run out and buy it, but if Revlon is BOGO and you're a fan of green, shimmery shadows, this one is definitely worth a try. Have you tried any of the Revlon Photoready Primer + Shadow Palettes? What's your verdict?